I think it probably goes without saying that Christmas is my favourite holiday. Ever since I was a little girl, I’ve loved the excitement of Christmas. And not even just of Christmas morning - but also of the month or so leading up to Christmas. Everything changes at Christmas time, like entering a completely different universe. Today, I thought I’d talk about a few of my favourite things related to the Christmas season. Since I could go on and on about this for probably the rest of December, I’m going to limit myself to just 5 of my favourite things. Christmas decorations are quite possibly one of the main things about Christmas that I love, for two reasons. First off, I love Christmas decorations because I just love to look at them. Ever since my family moved into our new house, we’ve been gifted with more spaces that are available for decorating. One of my favourite places is the front window, which is massive and looks out onto my court so when we put up our Christmas tree, you can see the lights through the window at nighttime and it’s absolutely magical. I love Christmas trees, villages, stockings, candles, garland, lights - oh I love me some Christmas lights. But the other thing I love about decorations is actually decorating. My family has always taken decorating very seriously and we consider it a family task. Since my boyfriend moved in a couple years ago, he’s become a part of the tradition which makes it even more exciting! Together we trim the trees with Christmas music and a glass of wine and have a ton of laughs. It’s so much fun and possibly one of the best traditions of the season. For many people, Christmas entails seeing their extended family (which can be either a good thing or a bad thing, depending!). For me, however, I don’t really have a close extended family, so Christmas is mainly for myself and my parents. We’re already a close-knit group but at Christmas time, we make sure to put our work or school or just generally busy lives aside to focus on spending time together and enjoying the season, whether that means trimming the tree or watching a Christmas film together. The Christmas season is extremely busy for everyone, especially because it means final exam season for me again now that I’m back in uni. But we have a very strict schedule of traditions that we make sure to stick to so that we don’t forget to put the stress aside and just enjoy Christmas together as a family! This is actually one of my new favourite things about Christmas! Last year, my family hosted our very first Christmas party. Our last house was actually bigger than our current home but it was more closed off where this new one is open-concept. So we’ve got a lot more space available for hosting parties. Since we live so far from a lot of our friends now, it’s nice that we get to invite everyone over to celebrate the holidays with! I always love introducing my friends to each other and having them all together as it’s so lovely to see everyone I care about getting to know one another! This one’s sort of a double-edged sword for me. I love buying gifts for my loved ones, but I also find it incredibly stressful as I’m the sort of person that agonizes for weeks whether a gift is good enough or not. However at the end of the day, I love the joy of finding the perfect gift for my friends, family or my bf. And there’s really nothing I love more than watching them open up their gifts on Christmas. It’s so lovely to see someone get excited over their gift!! Today I thought I’d do a bit of an advice post about one of the season’s most dreaded events: Christmas shopping. I’m the kind of person who loves buying gifts for people. I love finding the perfect present for a loved one, wrapping it up, writing the card, and placing it beneath the tree until I finally get to share it with them. But the whole process of actually buying the gifts can be extremely stressful especially if you suffer from anxiety, like me. So I thought I’d share a few of my favourite tips for making the most of the Christmas shopping experience. 1. Add a little bit of fun. A lot of the time when we’re faced with stressful situations, it can be really easy to fall into the trap of telling ourselves it’s going to be an all around awful time. It can make a huge difference if you go into it thinking it won’t be so bad! If you’re going out to brave the pre-Christmas mall crowds, especially as it gets closer to the holidays, try to set up your trip with a few relaxing, fun things. Make a playlist of your favourite Christmas tunes and play it on the drive to the mall. Dress in layers (this is so important, malls get hot my friends). Bring a friend and grab a festive-flavoured coffee or tea that you can sip while you walk around the shops. Seriously, these might sound like such small things but they really do make a major impact on your overall stress level!! There’s nothing worse than getting to the mall and falling into a panic because you have zero idea what you’re looking for or which shops to even go to. It makes you 100x more stressed out. Before you decide to head out, make a list of the things you’re considering for each person on your list. Even if you only have a vague idea of what you’re looking for, it will at least narrow down the shops you’ll have to go through and give you a better grasp on what you’re aiming to buy. There’s nothing worse than feeling completely overwhelmed by the chaos of the mall shoppers and the million shops with all of their displays. Make a list, put it on your phone, and look back at it whenever you’re feeling a little uneasy or lost. This is my greatest Christmas shopping life-hack EVER. Online shopping has become my BFF over the last couple years, especially when my anxiety has been at it’s peak. You can basically buy anything online nowadays (thank god for that) and a lot of stores will offer online exclusive deals throughout the holiday season, like BOGO or free shipping - so definitely take advantage of that. There’s also a whole community out there of online independent shops! It’s always nice to buy from online shops (like from Etsy) because you know that the money is going to someone’s family, rather than just a corporation. Not to mention you’ll be gifting your friend or family something that is a lil more unique which is really special as well! Back to the in-store shopping… If you decide that online shopping isn’t for you or it’s not accessible, but you still hate those mall crowds, try to do your Christmas shopping on off-days, or even off-times. Shopping in the morning or afternoon on a Saturday or Sunday is going to bring you face-to-face with the roughest of shopping crowds. But if you go on a Tuesday or Wednesday night, or even on your lunch breaks throughout the week, you’ll definitely face far less intimidating crowds than on the weekend rush. You’ll have more time and space to get your creative gears going! 5. Check online for coupons or sales. There’s no shame in getting a good deal on a gift!!! Lots of us are on tight budgets and what’s wrong in needing a little bit of help in buying our loved ones the perf gift? These days, coupons and sales are everywhere you look. If you sign-up for newsletters of stores you’re planning on shopping at, they’ll send out weekly or even daily emails full of information about how to save a few pennies. And if you’re shopping online, you can download a money-saver program like Honey or Wikibuy, which can go right on your Internet to directly save you money on purchases while you’re checking out your order. What are your top tips for Christmas shopping? Today is quite possibly one of my favourite posts of Blogmas and that is my favourite Christmas films. Films are a huge component to the holiday season for me. In fact, I see films as a huge component of my life in general. To me, there’s nothing better than cozying up underneath a thick fluffy blanket, with a steaming cup of hot cocoa, all ready to watch a holiday film. My holiday film collection grows more and more each year and it’s very lovely. So today, I thought I’d share with you guys all my favourite holiday films, in case you guys are looking for a new addition to your next holiday film marathon! I’m sure you all expected this one to come up on my list! Love Actually combines two of my favourite things: British rom-coms and holiday films. This ensemble cast film follows the lives of several Londoners as they encounter romance during the holiday season, all leading up to the Big Moment of Christmas eve. It also boasts quite possibly the greatest cast ever, featuring a bunch of Richard Curtis film regulars like Hugh Grant and Colin Firth, along with some other fab actors like the wonderful, late Alan Rickman. This is just a really feel-good, funny film that really shines a light on the importance of family and love. The Holiday is a newer favourite film of mine, as I just saw it for the first time last year or maybe the year before. It follows two women from opposite sides of the world who both decide they need a break from their lives, so they decide to swap houses for a few weeks over the Christmas holiday. While on their respective holidays, they both encounter people who get them to look at their own lives with a different perspective. It’s such a lovely, cheery film that just makes my insides super warm and fuzzy!! Kate Winslet is in this one, which automatically gives it bonus points in my books. Like Love Actually, this is a rom-com which is very much up my alley. Let me start off by saying that the Miracle on 34th Street that I hold near and dear to my heart is the 1994 version. Which I know is extremely controversial to some who say that the one and only version is the original 1947 film. But hear me out! I grew up on the 1994 film, as it came out just four years before I was born, so it was still fairly new. I’ve always loved the film, regardless of what people have said. I think the message of the film is still extremely important. And Dylan McDermott will always have a hold on my heart, no matter what. I think this is probably one of my top holiday films. It’s definitely one I have to see every holiday season, without exception. I also love how they incorporate elements of 1940s fashion to pay homage to the original film. So so cute. White Christmas holds a very special place in my heart and has for a while now. My mum has always loved this film, and she shared the love with me a few years ago. White Christmas is all about two American WWII soldiers who formed a performing act after the war. After receiving a letter from a former comrade-in-arms, they go see a sister duo perform in Florida. The foursome then embarks on a journey to Vermont where they spend the next few weeks planning an extravagant Christmas musical in honour of their former commanding officer. This is the only musical film on my Christmas favourites list and as you all should know by now, musicals are my favourite. ALWAYS. I think that it’s a really lovely film with a good meaning and some fabulous musical numbers. We can’t be friends if you don’t love the film The Santa Clause *shrugs*… Okay, maybe that’s a teensy bit overdramatic. No, but honestly, I think Santa Clause has been on my Christmas favourites list the longest out of all these films (except for maybe How The Grinch Stole Christmas). The whole concept of some random guy becoming Santa Claus just by being in the right place (or wrong place, depending on how you see it) at the right time is just so amusing to me. I love everyone and everything that makes up this film. Tim Allen really does a great job as the grumpy Scott Calvin who eventually learns to find the Christmas spirit in his heart and in his life. And let’s not forget to mention that Bernard totally steals the show. Ahhh the Grinch. This is a classic holiday film, in my opinion. I’ve loved this ever since I was a child, back when the jokes that Jim Carrey makes went straight over my lil head. But now as an adult, understanding the jokes in the film just makes it that much funnier. I love watching this film so so much. I truly think it’s the best adaptation and there’s never a time where I’m not up to watching it. Jim Carrey is phenomenal in this film and his improvisation of Ron Howard is possibly one of my favourite film scenes of all-time. And honestly, aren’t we all a bit like the Grinch sometimes? I know I am for sure haha. And of course, every time I see this film, I have the song Where Are You Christmas stuck in my head for days. (It’s still stuck in my head from last year tbh). To see a list of all my Blogmas posts, click here. I’m a list-maker. I feel like making lists is extremely therapeutic, not to mention extremely useful. I make lists for everything. What I need to do in a day or in a week, shopping lists, reading lists, so on and so forth. One of the best lists to make, at least for me, are bucket lists! Of course, the whole idea of bucket lists are super morbid (kick the bucket… like really??) but I don’t take it that way. I see bucket lists more as a list of things I absolutely would love to do! I first came across the idea of doing a monthly bucket list on Pinterest. I thought I’d give it a try and what better time to do it than in December, when all the Christmas festivities are in full action! December is one of my favourite months as it’s (in my opinion) the coziest month. Everything is so lovely and serene, and everyone’s in the mood to be merry! So without further ado, here’s my December bucket list! 1. Read a holiday-themed book. 2. Have a holiday film day. 4. Do some holiday baking. 5. Visit a Christmas market. 6. 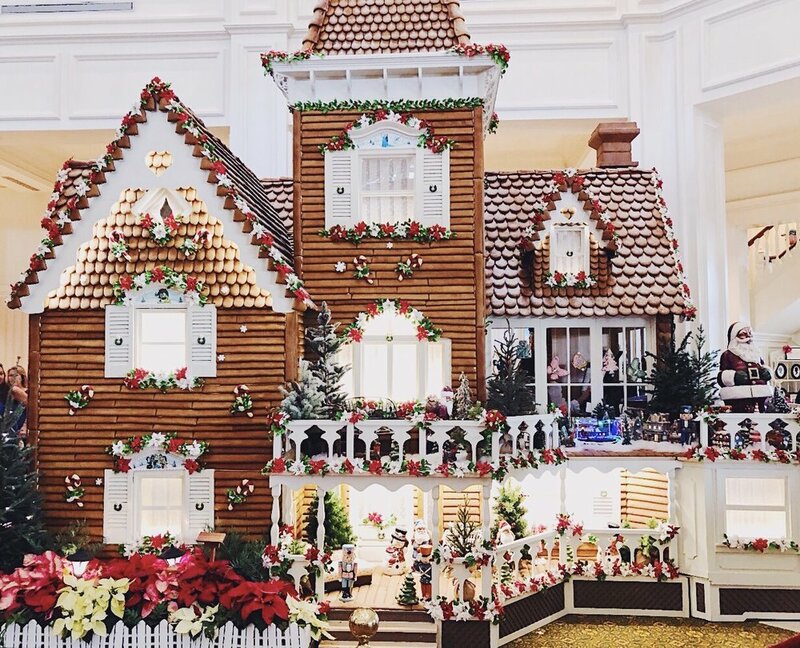 Decorate a gingerbread house. 7. Light the perfect Christmas candle. 8. Get all my Christmas shopping done. 10. Get a Christmas-inspired manicure. 11. Have a holiday drink at Starbucks. 12. Rock a red lip. 13. Take a walk in the snow. 14. Have breakfast for dinner. 15. Do a random act of kindness. 16. Try a new hobby. 19. Try my hand at creating a festive holiday cocktail. 20. Add a new piece to my Christmas decor. 21. Watch my town’s Santa Claus parade. 22. Make the perfect cup of hot cocoa. 23. 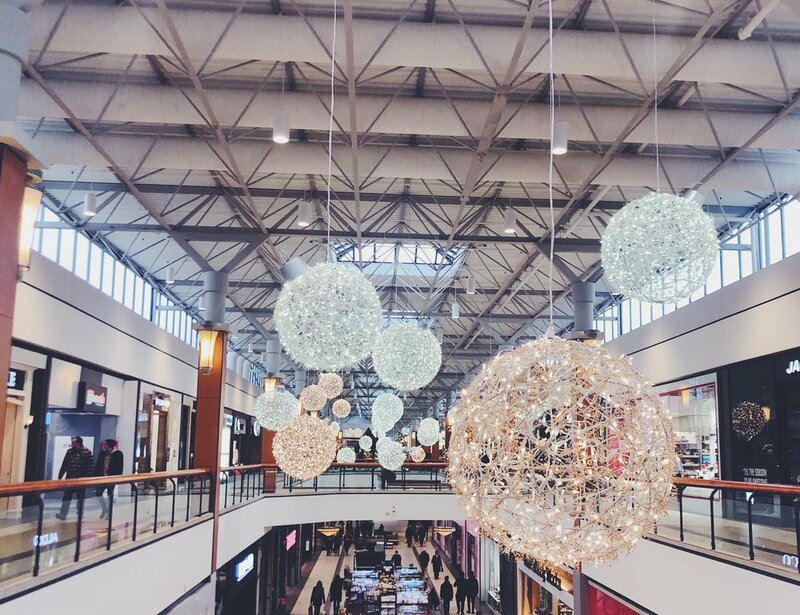 Brave the mall for some holiday shopping. 24. Have coffee with a friend. 25. Have a soak in the hot tub. First things first, if you haven’t read my introductory Blogmas post, you can check that out here. It explains the whole Blogmas concept and will also stand as a constantly updated reference guide with all of the links to my Blogmas 2018 posts. For my very first Blogmas post, I decided to start with one of my favourite Christmas-themed posts and that is the Christmas Tag! I try to do a Christmas tag every year at the start of the holiday season. I’ve done a few variations over the years, but this looks like it might just be a different one than usual so I’m going to give this a go! 1. What’s your favourite Christmas film? My favourite Christmas film changes pretty much daily, I can never stick to just one! I guess I’d have to say that it’s probably a tie (right now) between Love Actually and White Christmas. White Christmas for me has a lot of sentimental value as it’s mine and my mum’s go-to Christmas film to watch together, so it has to be included for sure! I live in Ontario, Canada. Every Christmas is a white Christmas! My holiday is split up all over the place. I spend the morning with my parents at home, opening presents and having egg sandwiches for breaky. Then I head up to my hometown to spend a few hours with my boyfriend’s family. And finally, my parents, boyfriend, and I go to Orlando for our holiday vacay! It’s a loonnggggg day. Oh my gosh, it’s like choosing between children, isn’t it?! I guess I’ll narrow it down to a few, because just one ain’t happening… “Do They Know It’s Christmas” by Band Aid, “Last Christmas” by Wham!, and “White Christmas” by Michael Buble & Shania Twain are in my constant rotation! Yes! As per a longstanding tradition, I open one gift from my parents on Christmas Eve and then I get a new pair of pjs (as do my parents). I love our pj tradition the most as it means we all get to wear brand new pjs to bed and for Christmas morning! By heart? Dasher, Prancer, Comet, Vixen, Rudolph… How many are there? Does it make me a fake Christmas fan if I don’t know? All of them… Is that a valid answer? I’m very excited for my second time seeing my town’s annual light-up night. I also cannot wait to decorate the house and trim the tree!! All three of our trees (yes, three) are fake. I’d love to have a real one but I’ve heard that they’re poisonous for dogs and I don’t trust my pup enough! I positively love gingerbread cookies. Just the smell of gingerbread alone is simply divine. This is a hard question! I mean, everyone loves getting gifts, we all know that. I especially love the excitement in other people’s faces when I’m opening up a gift they bought me. But also, I love giving gifts so much because you get to pick out something for someone you love and wrap them up and watch them open them up! 11. What’s the best Christmas gift you’ve ever received? New York City! It is my absolute dream to stand in Rockefeller Center with all the lights and that massive Christmas tree. Fail. MISERABLY. I don’t know what it is, but I just cannot figure out how to wrap a gift nicely. Even a perfectly shaped box turns out to be a disaster. Probably the first time I ever went to Disney World during the holidays. I hate the idea of making resolutions because it’s become a huge cliche where you’re obligated to stick to them or else you’re a failure. I like to set (realistic!) year-long goals instead and reflect on how I did at achieving them by the end of the year. 17. What makes the holidays so special to you? I just love the sentiment behind the holidays. Bringing the family together, no matter what else is going on in your lives, for no other reason than just celebration and being merry together! You know what that means. It must be Christmas!! Tomorrow is the first day of December my darlings! And with that comes the start of a very special blogging tradition that I am extremely excited to say that I will be taking part in this year: Blogmas! For many, many years, I’ve watched bloggers and youtubers alike doing Blogmas, starting with Zoella all the way back in 2012-2013. I’ve always loved the idea of Blogmas because I feel like it’s a way to not only celebrate the holidays as a community, but also to keep the festive feeling going throughout the season. I really think that Christmas is a holiday that is best spent with other people. But as bloggers can be scattered across the country, or even the globe, it’s nice that Blogmas gives us a way to come together and celebrate as a group! If you haven’t heard of Blogmas before, I’ll give a little bit of a rundown. Essentially, it’s a post per day for 25 days, starting December 1. The posts can be Christmas or even winter themed. Anything that makes you feel festive or will put other people in the Christmas spirit. Although it’s so much fun, it’s also a ton of work which is why I haven’t attempted it before this year. I really hope that I can make it work while also preparing for my fall finals but if it does work out, I’ll definitely try to make this a new yearly tradition! My very first post will be posted tomorrow morning at 10am, and the others will follow the same schedule. P.s. If any of you guys are taking part in Blogmas, leave your blog URLs down in the comments. I’d love to follow along your own journeys this Christmas season! Wow, it’s been awhile, hasn’t it? I’ve really neglected my little corner of the Internet and I won’t bother making up excuses why. Things have just been crazy and I’ve not been terribly good at time management as of late. But I’m back! And I promise to be more diligent. I thought today I’d just kick off with a bit of an update post, to let you all know where I’ve been and what I’ve been up to recently. At the end of August, I made my bittersweet return home from Florida. On the one hand, I was so sad to be leaving Florida, my home away from home but on the other hand, I was eager to get back to my proper home and get back into the swing of things. My journey home was actually a bit of a milestone moment for me, as it was the first time that my boyfriend and I travelled by plane without my parents. Taking a flight alone just the two of us was huge - if you suffer from travel anxiety like me, then you’ll get why. I was so nervous about the flight, but it all went very smoothly and I’m glad to have finally gotten it out of the way. Coming home was also a pretty big deal as it meant returning to uni. As I mentioned this summer in my ‘Why I Took A Break From University’ post, I decided to take a year-long break from school after my first year, to sort things out and put the focus on my mental health. Returning to uni was so. freaking. nervewracking. But it went quite well! I’m only taking 3 courses this term - a Jane Austen literature course, a Women’s History course, and a Mental Health & Addictions course - so my course load has been lightened a bit and I can put more of an equal focus on my studies and my mental health. If you didn’t already know, I’m working towards my Honours BA in English & Cultural Studies (a four-year program I’ve completed a year of so far) and I’ve recently added onto that a Minor in History! Unfortunately, being back in school means less time to spend with my boyfriend. Even though we live together, we have very opposite schedules. Most days, as he’s pulling up into the driveway in his car, I’m pulling out in my own and we just wave at each other through the window. He’s also got a far heavier course load than I have, what with being a Psychology major and all. Needless to say, it’s been difficult to make time for our relationship lately. That being said, it was recently our 5-year anniversary! We’ve been together for a quarter of our lives. Time really does fly. We had a lovely anniversary dinner at a local restaurant, had a few drinks, and just enjoyed some time alone. For our anniversary, my bf gifted me the Enchanted Disney Belle diamond promise ring. It’s absolutely stunning!! I was completely speechless about how thoughtful and genuine of a gift it was. I’d be remiss if I didn’t mention that this past weekend was my town’s annual fall fair! I love these fairs, you guys. They’re so wonderful and autumnal and nostalgic. My town is extremely small (at least to my standards, 10,000 is small) and very proud of our history - the fair has been running since 1873 so the historic aspect of the fair is really important. As my town is in the country, it’s only right that our fair is a typical county fair, complete with a demolition derby, midway, and tons of competitions of farm animals, food, needlework, and even pumpkins and hay! I never imagined I’d live in such a small town, coming from somewhere like Mississauga, but I could never leave the small town life now. I love the country sooo much. On a very exciting note, I finally got my hair done! Early this year (like maybe February?) I got a tiny bit of blonde put into my hair, but decided that I wanted some real blonde highlights for the summer, to lighten up my hair. I’d gotten the blonde highlights put in last summer as well, but after I had it done again this year, I just wasn’t feeling the blonde as much as before *shrugs*. So when I came home from Florida, I got my hair dyed back to a solid colour for the fall, except this time I went a shade or two darker than my natural shade and now it’s a dark chocolate brown. I LOVE IT. It feels sooo good to be a brunette again. I feel very autumnal, indeed. Hi, my name’s Felicia and I’m an autumn-aholic. Okay, but in all seriousness, I’m a teensy tiny bit addicted to autumn. It’s my favourite season after all. And what better way to fully embrace the autumn spirit than to fill your house with glorious scents of pumpkin and apple delight! Bath & Body Works is my go-to for candles and other home-related scents, even though I’m slowly warming up to Yankee Candle too. I just think their scents and the designs of their candles are so lovely, and they’ve typically got great sales going on. Since I’ve returned from Florida, I’ve done two separate trips to Bath & Body Works and spent a bundle each time… Oops. I’ve bought quite a few lovely autumnal things that I thought I’d share with you guys today as a) I love sharing the autumnal joy and b) I haven’t done a haul post in quite some time. So let’s get right into it, shall we? Stress Relief 3-Wick Candle [x] - This was the first of two replacement candles I purchased, as two of my favs were nearly completely burnt out. This candle has a lovely scent of eucalyptus and spearmint that is soo soothing. I usually burn this candle while I’m studying or doing homework, as a little way to keep my stress levels down while I get to work. I’ve found it’s really made an improvement to the whole experience! Mahogany Apple 3-Wick Candle [x] - Surprisingly, this my boyfriend’s favourite scent of the Bath & Body Works collection and this is the second of the two replacement candles - he nearly burnt his entire first candle in this scent. My boyfriend is not at all into candles or scents at all for that matter, but this one is an exception. It’s a mix of mahogany woods, golden apple, pink peppercorn, and fresh lavender sprigs. Vanilla Pumpkin Marshmallow 3-Wick Candle [x] - Prior to this year, I’ve been very anti-pumpkin (I know, I know, I’m in the minority). I’ve never liked anything pumpkin before, except for as decor, so I never gave pumpkin-scented candles much attention. But this year I thought I’d branch out and give them a try. After a bit of a browsing, I realized I do like some pumpkin candles after all! This was one of the ones I loved most - I really liked about 4 but could only afford to buy a couple haha. It’s got a delicious scent of vanilla, pumpkin spice, homemade marshmallow, and caramel that really smells like a confectionary to me. It’s very sweet, but wonderful. Pumpkin Apple 3-Wick Candle [x] - This had to be my absolute favourite pumpkin-scent in the entire store. It’s a mix of red delicious apples, pumpkin, cinnamon, and clove buds. I’m not usually big on cinnamon, in fact certain levels of cinnamon make me a bit nauseous, but I find it hardly noticeable in this candle, more of a background note. I’ve burnt this one the most so far and can see it running out before the season is done if I’m quite honest! I’ve also become quite the connoisseur of car scents in the past few months after I discovered the Yankee Candle scents (which you can read about in my Recent Favourites post). How did I not know until now that Bath & Body Works sells car scents?! The Car Scentportables are so cool because you first buy a little vent clip (there are a ton of cute designs, mine is a rosy gold one) and then you buy refills to put in the holder. The refills come at about $3.50 a piece, but there was a 4/$10 sale going on when I was at the store so I bought 4 :) I like how you can buy any refill you like, which means that as the seasons change, so can my scents! (You can buy my holder here). Car Scentportables Pumpkin Apple Refill [x] - Of course I bought the Pumpkin Apple scent for my car!! It’s autumn (almost) after all! I’m sure this will be the first one I use, once I’ve gone through my Yankee Candle scents. Car Scentportables Sweater Weather Refill [x] - Oddly enough, I don’t actually have the Sweater Weather candle, even though I love the scent. It smells of fresh sage, juniper berry, aromatic eucalyptus, and fresh woods - so it’s a very nature scent, which I really like. Car Scentportables Flannel Refill [x] - Girl I love me some Flannel. Is this anyone else’s fav autumn scent?! I have it in a hand soap too and oh my goshhh it’s heaven. The fragrance is crisp autumn air, bergamot, heirloom mahogany, and soft musk. Car Scentportables Vanilla Bean Refill [x] - And, of course, I had to pick up a lovely vanilla scent because I’m a major vanilla fan. I feel like this would be a good anytime scent for any season, in-between trips to Bath & Body Works to get new refills! Hello everybody! How are you all on this lovely afternoon? Early last week, I decided that I wanted to treat myself to a little pick-me-up so I stopped at my local drugstore to do some poking around. I ended up finding this lovely Soap & Glory cleansing milk. I've been a fan of Soap & Glory since my high school days but I haven't bought anything of theirs in a long time. When I found this, I knew I needed to give it a go. It's got a lovely scent and every time I've used it, it's left my skin feeling refreshed and looking glowy af! I've been using the OGX Renewing Argan Oil of Morocco Penetrating Oil for years now and have absolutely loved how it makes my hair look and feel. So when I came across this hair butter, I thought I'd give it a try. I've never tried a hair butter before but I've been really enjoying it so far! The cool thing about this product is that it can be used in two different ways: as an in-shower rinse out or as a leave-in conditioner. I've only used it as a rinse out so far, but I'm excited to try it as a leave-in too! After my shower, it left my hair so much more hydrated and tangle-free than usual. Plus, it smells divine. Washing makeup brushes is such a chore, isn't it? I always dread when it's time to go through the process of individually cleaning my brushes (I've got quite a few by now). Which is why I bought this cleaning glove from e.l.f.! With all the different ridges across it, all you have to do is lather the makeup brush cleaner (or baby shampoo, in my case) and this bad boy does most of the work for you! Honestly, my brushes have never been so clean so quick before. Y’all already know how much I love my peaches - and my peachy toned shadows. So it shouldn’t be a huge surprise that one of my recent favourites is the Too Faced Just Peachy Mattes palette! I have already been in a deep love affair with the Sweet Peach palette they released a couple years back, but when I popped into Sephora this summer for the first time in a long time, I couldn’t leave without this baby. The shades are absolutely beautiful and so versatile. I think they’re perfect for autumn. I bought this when I was in Florida this summer and it's easily become one of my favourite products of the year (possibly of my life?). All summer, I've been suffering with fairly unbearable back and neck pain, so much so that at times, I was up all night in pain. Nothing was working to help and I was getting frustrated. I went on Amazon and after a quick search, I found this hot water bottle. IT'S A LIFE SAVER. All you do is fill the water bottle with hot water from a kettle and twist on the cap and voila! It keeps the water hot for hours and even with the sweater cover on, you can really feel the heat. I’ve been completely obsessed with car fresheners as of late, and this Yankee Candle one is my current fave. This lovely scent hangs in a small plastic jar off your rearview mirror. The scent, Macintosh, smells sooo strongly of apples which I absolutely adore and think is perfect for the upcoming autumn season. I really find that the Car Jar produces the strongest scent, in comparison to the car vent clips (which I’ve also used) but that’s just my personal opinion! As always, I have to mention a tv show in my favourites. Recently, I've been really enjoying the show The Fosters. I have always seen commercials for this show on Freeform whenever I was in the US but I never really thought much about it. Finally, after hearing so much about it, especially with Noah Centineo becoming so popular lately, I thought I'd start it. It's about a police officer, Stef, and her partner, Lena, and their large, blended family comprised of Stef's biological son and a pair of twins that the couple adopted when they were children. Things start to change when they take in a foster child, Callie, who's recently been in juvie, and her younger brother, Jude. Y'all know how much I love me a good family drama and this one definitely fits the bill!